On a gloriously sunny weekend in June Bath Cantata Group along with some members from Bath Consort, the Kertész String Quartet and other professional musicians came together to perform two semi-staged productions of Henry Purcell's first opera Dido & Aeneas. The first was held at the cantata group's traditional summer retreat, Freshford Memorial Hall and was preceded by a picnic in the Queen Elizabeth Field next to the hall. This relaxed time in the sun set the scene perfectly for what was to be a wonderful evening. Baritone Richard Fitzsimmons along with BCG first performed Vaughan Williams' Five Mystical Songs to a packed hall. The choir, in great form, supported the soloist in the first three of the songs leaving Richard to sensitively perform number 4, The Call on his own before it was the choir's turn in number 5, Antiphon where they stepped up to the fore with a gusto performance! Following this, the musical director, Neil Moore announced there would be a short interval during which the musicians came on and tuned up ready for the opera. Neil then appeared in full Baroque costume bearing a striking resemblance to Purcell himself! What followed has to be one of the best performances Bath Cantata Group has performed in many years! The Kertész String Quartet's steely brilliant playing was truly spellbinding on their period instruments. They were joined by Keith Tempest, cello, James Watts, oboe and recorder, and Jacquelyn Bevan, harpsichord. The soloists were excellent, most notably Marie Elliott as Dido and Julia O'Connor as Belinda. An audible sigh at the end of the performance following a breathtaking Dido's Lament sung by Marie Elliott and final chorus from the choir encapsulated what everyone must have felt - that they'd been part of something rather special. All of this, minus the Vaughan Williams was repeated the following evening in Midsomer Norton Town Hall to another full house. Roses were appropriately thrown at the end of this performance highlighting the final chorus '...and scatter roses on her tomb...'. 'Bravo' was shouted from a passing car to some of the performers! A recording was made of Saturday's concert (Act III only) which can be listened to by clicking here. Bath Cantata Group’s Spring concert, held at St. Stephen’s Church, Lansdown on 21 March offered a suitably Lenten theme with works by Handel and Duruflé. Describing the music choices as ‘dark, austere and reverential’, Musical Director Neil Moore’s programme introduction prepared me for a thoroughly depressing evening – but luckily, that was not the case at all! It started with the Vicar of St. Stephen’s, computer-scientist turned CBeebies producer turned priest, the Rev. Philip Hawthorn, delaying the proceedings by almost seven minutes to tell us a joke, introduce the choir, and say a prayer. That said, he’s a very endearing performer in his own right and settled us in for the evening. Commissioned only 10 days before its first performance at the funeral of Queen Caroline, wife of George II in 1737, Handel’s anthem The ways of Zion do Mourn, pays tribute to the popular Queen. The choir, although it had considerably more time to rehearse than Handel’s, has a lot to do in this piece, appearing in all but two of the twelve sections, not including the opening orchestral prelude. The soloists, Julia O’Connor, soprano, Gill Clark, alto, Chris Pelmore, tenor and Richard Fitzsimmons, bass had the remaining two movements in which to shine. The orchestra – mostly strings with a small wind contingent and chamber organ – set up the mood of with the opening prelude. It took the string section a few minutes to come together, but considering they had probably only met that afternoon for a full rehearsal, there was a fine performance from the whole orchestra. The first choral section, The ways of Zion do mourn states the mood of the country on the death of their favourite Queen – bitter, sad and indignant – emotions the ensemble managed to convey with great clarity under the direction of Neil Moore. The next few sections came together well too, with the men worthy of a special mention for their strong tonal contribution to the overall sound. Also outstanding was the soloist and long-time friend of the choir, Gill Clark, whose fine alto voice is a delight to listen to, whatever she’s singing. Towards the end of the piece, however, the four soloists got slightly masked by the string section in their rendition of They shall receive a glorious kingdom. But the finale – The merciful goodness – which was greatly enhanced by the addition of the soloists to the choral ensemble and the orchestra, by now well-synchronised and perfectly in tune, brought the performance to a sombre and peaceful ending. 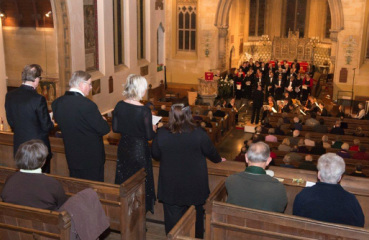 At the interval, there were about 120 audience members and 50 performers chatting in the church – a manageable number, but given the quality of the performance and the amount of work put into it by the choir, there really should have been a larger audience. The venue is warm and bright, physically and acoustically, but tends to benefit from more, rather than less people in the audience (or congregation). The refreshments at the interval are excellent and reasonably priced, with the profits going to the choir to support its activities, which probably should include more marketing in the future! 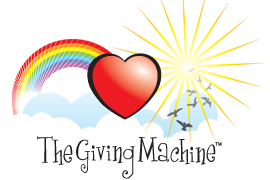 Part two featured music with the same purpose, almost, but written some 200 years later by the French organist and composer, Maurice Duruflé. Quatre motets sur des thèmes grégoriens, uses Gregorian chant as their inspiration. Brought up in the traditions of the French Catholic Church, Duruflé is well-known for his sacred choral and organ music and these motets written to be sung ‘a capella’ started off the second half. Confusingly, having assembled neatly on the stage, the choir was then asked to sit down, whilst the conductor headed back off the stage to look for someone. It was a comic moment but well diffused by Neil Moore, who having located organist Nicholas Stuart and dragged him back to the organ, explained to the audience confidently that they needed him to pitch the opening note to the choir! Although composed in 1960, the Motets have a very ‘fin de siècle’ feel about them. The harmonies were reminiscent of Fauré in places and the highlight for me was the second motet, Tota pulchra es, with the sopranos and altos breaking into 3- and then 4-part harmony, opening in plainchant. Magical. The most remarkable aspect as an amateur choral singer myself, was that the choir remained perfectly in tune throughout each of these unaccompanied motets. Bravo! Next up, the final piece of the evening and the one to which I have to admit, I was looking forward the most. After the sublimity of the motets, the orchestra was back with added brass and timps, to perform Duruflé’s major post-war offering, his Requiem. Commissioned by the collaborationist Vichy régime in 1941, it was not published until after the War in 1947. It omits the Dies irae but includes a Pie Jesu, Libera me and in Paradisium for good measure. Perhaps the War held enough angst for the composer or maybe the Vichy régime just wanted something to calm people down after selling out to the Nazis. Whatever the case, the peaceful, soft Introit, which included muted brass and organ supporting the choir set the tone of this beautiful piece. After the Kyrie – performed sensitively by the choir with a grand crescendo before another delicate resolution – came Domine Jesu Christe, a beautiful balance of organ, brass, strings, timpani and voices – everyone very much on their mark in this section. A special mention should go to the harpist, Kate Pearson, for her part in this reduced orchestra version of the score; the band led as always by the very talented and devoted Matthew Taylor. It occurred to me that this particular piece creates a great impression whether it has a large or small ensemble performing it and the 40-strong group tonight could have held their own against any large choir and full orchestra. The Sanctus featured an especially fine performance from the gentlemen of the choir, rising silently, but a tad eerily from behind the already-standing women, just in time to deliver a very well-tuned and powerful chorus of Hosannah in excelsis – followed by a huge crescendo – a spine-tingling moment in the performance! Alto Gill Clark’s rendition of the Pie Jesu, was a moving performance also, gently accompanied by Nicolas Stuart on the organ and Kathryn Drury on cello – both clearly highly competent instrumentalists. The Agnus Dei was beautifully-paced and obviously well-enjoyed by choir and orchestra alike. The choir handled the long one-note phrases in the Lux aeterna with great skill and no tuning problems – as one had now come to expect – and Neil Moore’s direction ensured the reflective mood of the section was embraced by all. A dramatic start leading to a fine Baritone solo from Richard Fitzsimmons formed the penultimate choral section, Libera me. Great dynamics here – with the choir sounding very much in charge at this point. There were also powerful and exciting contributions from the 3 brass players, Colin Bloch, Charlie Matters and Alastair Clements and a nice little bit from the sopranos! In paradisium rounds off this wonderful piece with quiet melancholy. Bath Cantata Group continues to produce fine performances in a ‘family’ atmosphere, with familiar faces in the choir, orchestra and audience from concert to concert. One knows that most of these performers do it because they love it and it’s that commitment to the joy of singing and playing that keeps the amateur choral tradition alive. To be able to harness that love and produce such a memorable and fault-free performance is a tribute to the dedication and skills of all, but a special patience/dedication/perseverance award needs to go to the conductor and Director of Music, Neil Moore! Thanks to everyone involved for a thoroughly enjoyable evening. The definition of Splendour, according to the Oxford English Dictionary is “magnificent and splendid appearance”; that of splendid, “very impressive”. I would happily apply both definitions to the concert given by the Bath Cantata Group at St. Stephen’s Church, Lansdown, on 22 November. The whole affair lived up to its billing, “Baroque Splendour”, with professionalism, skill and clearly a good deal of hard work from the choir and orchestra alike. 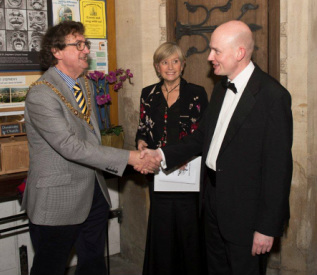 This was the fourth public concert brought to us by the new Musical Director of the Bath Cantata Group, Neil Moore, who took over from the choir’s previous director of 35 years, Edna Blackwell. Following his major undertaking of Elgar’s ‘Dream of Gerontius’ in May, involving Bath Cantata and three more choirs, Neil’s Baroque Splendour project was no less impressive. One felt transported back in time to the turn of the 18th century, with a very authentic sound from the 22-strong orchestra and 47 singers. The concert, with excellent and highly educational programme notes by Edna Blackwell and Neil Moore featured music from Henry Purcell (1659-1695), J.S. Bach (1685-1750) and Jean-Philippe Rameau (1683-1764). We opened to ‘Welcome to all the pleasures’, an Ode to Saint Cecilia, a 5th century martyr and the patroness of musicians, whose festival happens to fall on – 22 November! The choir was well-balanced with the orchestra and its direction by Neil Moore reflected the enthusiasm of the composer, Henry Purcell, who wrote ‘Welcome to all the pleasures’ at the age of only 24. The choir was well-practised and on point, with all parts contributing equally, producing a lovely balanced sound. The orchestra – 22 local professional and semi-pro musicians gave us a positive and spirited performance, with the first violins and bass section worth a special mention. ‘Welcome to all the pleasures’ was indeed a pleasure to hear, and behold! Next, the first of two sections from J.S. Bach’s Christmas Oratorio: parts I and III. First performed 280 years ago, this is another showpiece from perhaps the most influential composer of the period, if not of all time. With the addition of a drum and brass section, the orchestra rang out in early eighteenth century tones – the brass section, perhaps a little too bright on occasions, but spot-on in their tuning and combination – comprised three highly talented musicians; Colin Bloch, Rob Bartlett and Charlie Matters. The timpanist, David Dixon, produced some truly splendid sounds that tied many of the sections together and filled the church with beautifully-timed sequences. The soloists in this concert were exceptional. The tenor, Paul Smy, has a powerful and extremely versatile range; bass Richard Fitzsimmons a strong, yet mellow tone, which complimented the other soloists perfectly. The counter-tenor, Sebastian Field, has a truly astonishing voice; his delivery of the well-known aria ‘Bereite dich, Zion’ was a moment to remember. In the soprano section, Julia O’Connor, a well-known local operatic, ensemble and chamber performer, gave a rousing pitch-perfect performance, ably partnered by Annette Barker, pulled from the ranks of the sopranos for the evening to replace Philippa Neaverson, who was sadly ill and unable to perform. The choir, set up on a podium behind all these other luminaries, made an excellent account of itself, with strong, well-timed entries, great dynamics, and did a terrific job of holding their own against the more powerful elements in the orchestra. I was particularly impressed with the men, who managed to shine through and make a very respectable sound despite being heavily outnumbered by the ladies! It was good, if not a little unusual with amateur choirs, to see nearly all the members referring to the conductor nearly all of the time. In the second half, the ensemble took on the second Bach composition, Part III of the Christmas Oratorio, with renewed vigour following the 20-minute interval, rejuvenated no doubt by the excellent refreshments on offer from the volunteer servers, as ever supplied from the ranks of the choir. The whole ‘event management’ of these concerts is remarkably smooth, considering most of the organisers also have to sing their hearts out too! Thanks must go to the Chairperson, Helen Chalmers for a good deal of the organisational work. The second Bach composition in this concert, part III of the Christmas Oratorio was delivered with the same high quality as part I, with amongst other treats, an excellent duet from the soprano Julia O’Connor and bass, Richard Fitzsimmons, and as ever, a solidly reliable performance from Nick Thorne throughout on the organ. The sound changed dramatically as we entered the court of Louis XV for a marvellous performance of solos, duets and choruses taken from Jean-Philippe Rameau’s second opera-ballet, ‘Les Indes galantes’, in the 250th anniversary year of his death in 1764. It’s an interesting and oddly relevant piece, as it takes as its theme the ‘interplay’ between the races that occurs when one country invades another, albeit with a rather romantic take on the subject. The four love-story sections of ‘Les Indes galantes’ are set in Turkey, Peru, Persia and of all places, Illinois, USA (where a Spaniard and a Frenchman compete for the love of a Native American). The choir dealt very effectively with the French libretto and the orchestral performance had a very Gallic feel. As in the Bach and Purcell before, Moore produced a truly authentic sound reflecting the time and place of the origination of these pieces. Again, the soloists skilfully gave of their all, with a special mention to Julia O’Connor and Annette Barker for some lovely duet work and to the trumpet and timpani sections of the orchestra, who let rip in that glorious ‘fanfare municipale’ fashion when called on to do so! All in all, this was a great example of what nearly 70 dedicated musicians can do on a tiny budget with a huge dollop of commitment, perseverance and clever direction. I look forward to seeing what Musical Director Neil Moore conjures up for us (Duruflé and Handel have been mentioned) at the next concert, which will be in March 2015. "Just wonderful!" That was the reaction I heard repeated many times, following the rousing performance of Elgar's 'The Dream of Gerontius' at St John the Evangelist Church, Bath on Saturday 17th May. Under the skilful direction of Conductor Neil Moore, four choirs - Bath Cantata Group, Bradford on Avon Choral Society, Noctis Chamber Choir and Vox8 Chamber Choir, accompanied by the appropriately titled 'Bath Gerontius Orchestra', delivered an impressive interpretation of a dramatic and technically difficult work, to a packed audience, which included Councillor Ian Gilchrist, Deputy Mayor of Bath. The three soloists, Rupert Bevan (Gerontius), Penelope Davies (Angel) and Rick Fitzsimmons (Priest/Angel of Agony) all gave excellent, robust performances. The church acoustics provided an appropriate setting for the work; the crescendo of the most dramatic parts surpassed only by the volume of the rapturous applause at the end. This event has, without doubt, put Neil Moore on the musical map in the South West for conducting important choral works. The Bath Cantata Group under the direction of Neil Moore, with vocal soloists and an orchestra led by Matthew Taylor enraptured an appreciative audience at St Stephen’s Church,Lansdown on Saturday March 15th. The programme consisted of works by Elgar, Fauré, Mozart, Handel and CPE Bach. The choir number 34 expanded by 9 extra voices while the solo parts were taken by Julia O’Connor, Pamela Rudge, Rupert Bevan and Paul Fletcher. The orchestra accompanied Julia as she sang an aria from Handel’s opera ‘Rinaldo’ and Chris Wilkes and Kate Watt as they played the andantino from the flute and harp concerto K 299 by Mozart. We have no doubt that the choir would welcome more voices, while we enjoy being ‘Friends’ of the choir receiving notice of concerts and our tickets. From the start, a good sound came through from all sections of the choir and the response from the audience (happily including Beresford King-Smith), was extremely positive and enthusiastic; they even showed a marked reluctance to leave at the end! Neil, too, looked as though he was enjoying the music which is always an encouraging sight for a choir! The orchestra played fantastically throughout and took full advantage of their opportunity to shine in Arensky's Variations on a theme of Tchaikovsky; many in the audience commented on how well they played. See our ARCHIVE section for more photographs of the evening, provided by Alastair Chalmers. Thanks to all of you who came and supported us! Part of the choir sings from the balcony.